Lever and Bloom under a blue sky. Does a take-away need to be rushed? A coffee so quick that there is ‘not enough time to prepare a flat white’? Are we always so preoccupied with the distractions of our day that we consume our coffee merely for the pleasant caffeine kick that it provides? 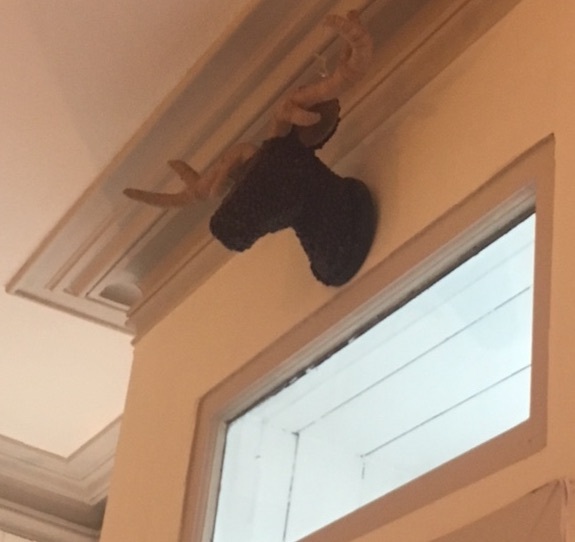 Lever and Bloom in Bloomsbury is a great example of why this does not have to be, indeed should not be the case. 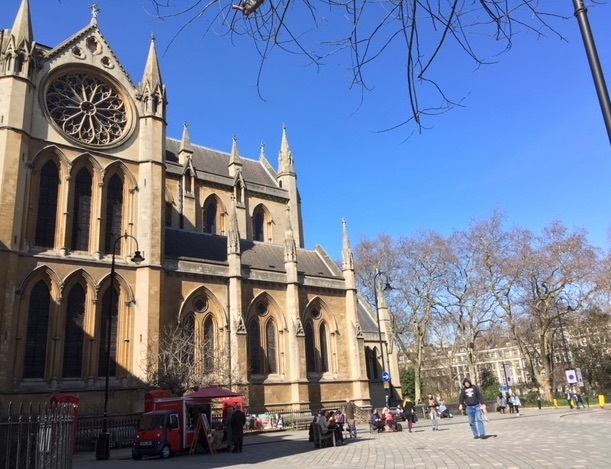 Since 2015, Lever and Bloom have been operating out of a cart on Byng Place close to UCL and a number of other research institutes. The character of the surroundings really does affect the space and both times I have been to Lever and Bloom I have either met interesting people in the queue or overheard snippets of intriguing conversation about history I know nothing about. 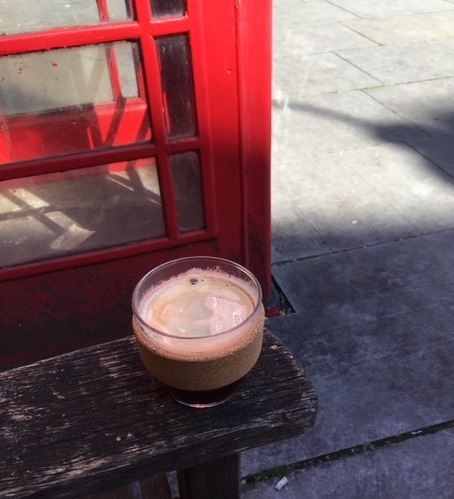 Long black in a keep-cup and telephone box in Byng Place. 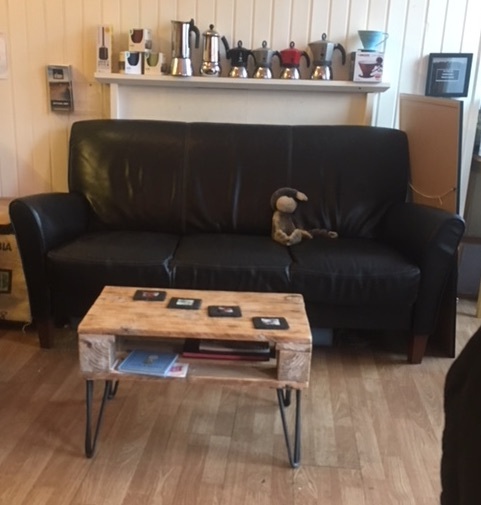 It is easy to spot the coffee cart in the corner. Firstly, it is bright red and quite eye catching but secondly because of the queue forming in front of it. Don’t be put off though, the queue moves very quickly so you won’t wait long even if you are in a rush. Queueing however does give you an opportunity to peer into the cart. Space is used extremely efficiently. with each piece of equipment apparently having its own perfect home. It reminded me of a childhood game of trying to fit in as many objects as possible into a matchbox. A cabinet on the table in front of the cart displays cakes including cinnamon rolls (sadly sold out by the time I arrived in the afternoon). It was also nice to see the number of people ahead of me in the queue who were using re-usable cups. The lever of the name refers to the (Izzo Pompei) lever espresso machine that is used on the cart. It was fascinating to watch the ground beans being carefully tamped and the lever being pulled to prepare the espresso. Although there is some debate as to the optimum water pressure needed for preparing an espresso, the standard pressure is 9 Bar; water is pushed through the tamped grinds at nine times the atmospheric pressure at sea level. Watching these espressos being prepared reminded me of preparing ceramic samples of an interesting magnetic material a few years ago. We were interested in the electrical properties of a class of materials called manganites. To prepare the materials for measurement we first had to grind the pre-cursor powders (but with a pestle and mortar, no burr grinders) and then, after a couple of further preparatory steps, press them into a pellet ready for firing in the oven. The machine used for pressing the pellets had a lever, not dissimilar to that on the espresso machines and yet, the pressure that we used for the pellets was roughly 1000 Bar. This high pressure was needed so that dense pellets of manganite material would be formed when we heated it in the oven (typically at 1200 ºC). 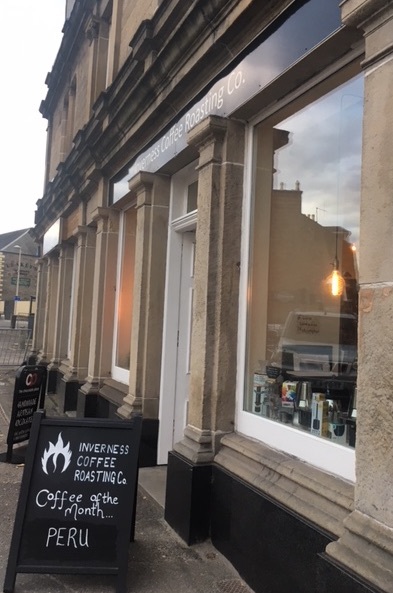 Just as a good espresso depends on the pressure and then the temperature and time of extraction, so the properties of the pellet would be affected by the pressure and then temperature and time of firing in the oven. 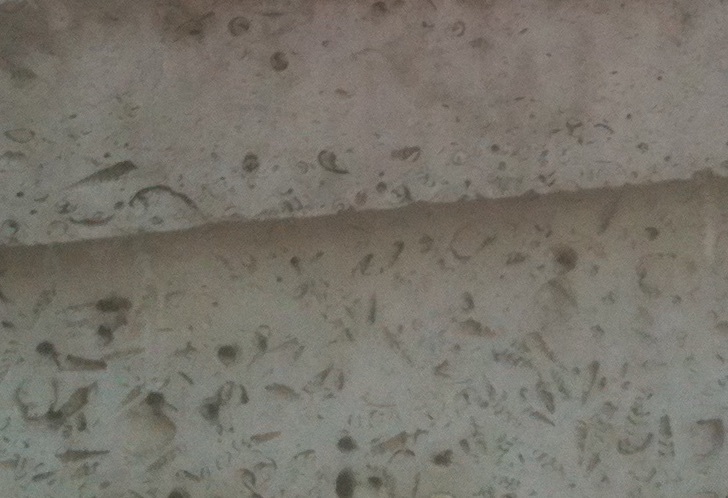 Fossils in Portland Stone. It is astonishing what is revealed when you slow down and notice the buildings around you. Similar effects affect the rocks of the earth, something that is particularly visible in the area around Lever and Bloom. A geological walking tour around Byng Place, Tottenham Court Road and towards the British Museum illustrates this particularly well. Behind Lever and Bloom, the church of Christ the King is built from Bath Stone. An oolitic limestone, this type of rock is formed of compressed sand and bits of shell. Much as the manganite samples of my study before they were fired in the oven but of a more interesting colour. Heading towards Gower St and the impressive UCL building is made of Portland Stone. Another limestone, this building material is a goldmine for urban fossil explorers. Continuing the walk, on Tottenham Court Road, the Mortimer Arms pub is fronted by quartzite while Swedish Green Marble adorns 90 Tottenham Court Road. Quartzite and Marble are both types of metamorphic rock, formed by pressing together different precursor materials at high pressure and temperature. Other types of marble can be seen on the tour, suggesting the influence of pressure and temperature of formation on the rock structure as well as the type of precursor rock. It would seem that such a walking tour is perfectly timed for a longer style of coffee, perhaps a latte (in a re-usable cup of course) from such a centrally located place as Lever and Bloom. And of course, assuming you are using a re-usable, there is even more to ponder. The pressure and temperature during the manufacture of the re-usable cup would have affected the properties of the cup (or in my case, glass). Let me know if you spot any interesting rocks or fossils during your time at Lever and Bloom but whatever you do, I hope that you can enjoy your coffee and then slow down to enjoy it a bit more.